The Peloridiidae (Coleorrhyncha) were not included in Song's analysis. 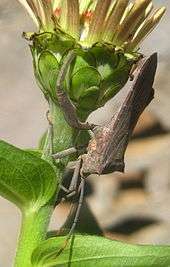 The suggestion that the Auchenorrhyncha are paraphyletic has been debated, and in 2012, the phylogeny was described as "contentious"; a multilocus molecular phylogenetic analysis suggested that the Auchenorrhyncha, like the Sternorrhyncha, Heteropterodea, Heteroptera, Fulgoroidea, Cicadomorpha, Membracoidea, Cercopoidea, and Cicadoidea, were all monophyletic. The closest relatives of hemipterans are the thrips and lice, which collectively form the "hemipteroid assemblage" within the Exopterygota. 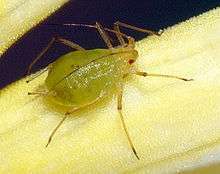 Many aphids are parthenogenetic during part of the life cycle, such that females can produce unfertilized eggs, which are clones of their mother. All such young are female (thelytoky), so 100% of the population at these times can produce more offspring. 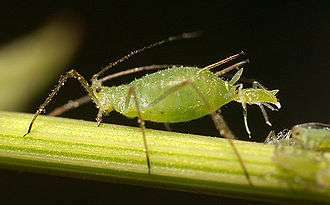 Many species of aphid are also viviparous: the young are born live rather than laid as eggs. 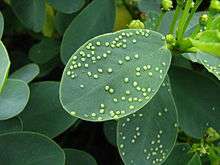 These adaptations enable aphids to reproduce extremely rapidly when conditions are suitable. 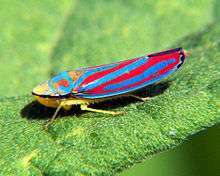 ↑ The green/red flash coloration earns the insect the name of stop and go cicada. 1 2 3 4 Jon Martin; Mick Webb. "Hemiptera...It's a Bug's Life" (PDF). Natural History Museum. Retrieved July 26, 2010. 1 2 "Insect groups (Orders)". Amateur Entomologists' Society. Retrieved 16 July 2015. 1 2 3 Coulson, Robert N.; Witter, John A. (1984). Forest Entomology: Ecology and Management. John Wiley & Sons. pp. 71–72. ISBN 978-0-471-02573-3. 1 2 3 Song, Nan; Liang, Ai-Ping; Bu, Cui-Ping (2012). "A Molecular Phylogeny of Hemiptera Inferred from Mitochondrial Genome Sequences". PLOS ONE. 7 (11): e48778. doi:10.1371/journal.pone.0048778. ↑ Forero, Dimitri (2008). "The Systematics of Hemiptera" (PDF). Revista Colombiana de Entomologia. 34 (1): 1–21. Archived from the original (PDF) on January 13, 2015. ↑ Cryan, Jason C.; Urban, Julie M. (January 2012). "Higher-level phylogeny of the insect order Hemiptera: is Auchenorrhyncha really paraphyletic?". Systematic Entomology. 37 (1): 7–21. doi:10.1111/j.1365-3113.2011.00611.x. ↑ "Suborder Auchenorrhyncha". NCSU. Retrieved 12 July 2015. ↑ "Sternorrhyncha". Amateur Entomologists' Society. Retrieved 13 July 2015. ↑ "Hemipteroid Assemblage". Tree of Life Web Project. 1995. ↑ André Nel; Patrick Roques; Patricia Nel; Alexander A. Prokin; Thierry Bourgoin; Jakub Prokop; Jacek Szwedo; Dany Azar; Laure Desutter-Grandcolas; Torsten Wappler; Romain Garrouste; David Coty; Diying Huang; Michael S. Engel; Alexander G. Kirejtshuk (2013). 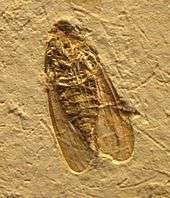 "The earliest known holometabolous insects". Nature. 503 (7475): 257–261. doi:10.1038/nature12629. ↑ Shcherbakov, D. E. (2000). "Permian faunas of Homoptera (Hemiptera) in relation to phytogeography and the Permo-Triassic crisis" (PDF). Paleontological Journal. 34 (3): S251–S267. 1 2 3 4 5 6 Gullan, P.J. ; Cranston, P.S. (2014). The Insects: An Outline of Entomology, 5th Edition. Wiley. pp. 80–81, 790–. ISBN 978-1-118-84616-2. ↑ Chinery, Michael (1993). Insects of Britain and Northern Europe (3rd ed.). Collins. ISBN 0-00-219918-1. 1 2 "Hemiptera". Discover Life. Retrieved 13 July 2015. ↑ Virant-Doberlet, Meta; Cokl, Andrej (April 2004). "Vibrational Communication in Insects". Neotropical Entomology. 33 (2): 121–134. doi:10.1590/S1519-566X2004000200001. ↑ Simmons, Peter; Young, David (1978). "The Tymbal Mechanism and Song Patterns of the Bladder Cicada, Cystosoma saundersii" (PDF). Journal of Experimental Biology. 76: 27–45. ↑ Wilcox, R. Stimson (1975). "Sound-producing Mechanisms of Bueno macrotibialis Hungerford (Hemiptera: Notonectidae)" (PDF). 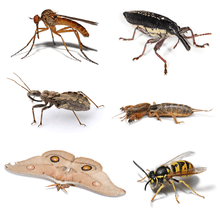 International Journal of Insect Morphology & Embryology. 4 (21): 169–182. doi:10.1016/0020-7322(75)90015-x. ↑ Britton, David (9 July 2009). "Metamorphosis: a remarkable change". Australian Museum. Retrieved 13 July 2015. ↑ Mackean, D.G. "Aphids, an Introduction". Biology Teaching Resources. Retrieved 13 July 2015. 1 2 Bush, John W. M.; Hu, David L. (2006). "Walking on Water: Biolocomotion at the Interface". Annual Review of Fluid Mechanics. 38: 339–369. Bibcode:2006AnRFM..38..339B. doi:10.1146/annurev.fluid.38.050304.092157. ↑ Loxdale, H. D.; Hardie, J.; Halbert, S.; Foottit, R.; Kidd, N. A. C.; Carter, C. I. (1993). "The relative importance of short- and long-range movement of flying aphids". Biological Reviews. 68: 291–311. doi:10.1111/j.1469-185X.1993.tb00998.x. ↑ Burrows, M. (March 2013). "Jumping mechanisms of treehopper insects (Hemiptera, Auchenorrhyncha, Membracidae)". Journal of Experimental Biology. 1 (216 (part 5)): 788–799. doi:10.1242/jeb.078741. PMID 23155084. ↑ Gorb, S. N. (July 2004). 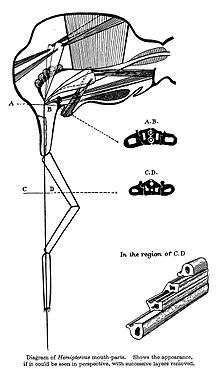 "The jumping mechanism of cicada Cercopis vulnerata (Auchenorrhyncha, Cercopidae): skeleton-muscle organisation, frictional surfaces, and inverse-kinematic model of leg movements". Arthropod Structure & Development. 33 (3): 201–220. doi:10.1016/j.asd.2004.05.008. PMID 18089035. 1 2 Grimaldi, David; Engel, Michael S. (16 May 2005). Evolution of the Insects. Cambridge University Press. p. 289. ISBN 978-0-521-82149-0. ↑ Labandeira, Conrad C. (May 1998). "Early History of Arthropod and Vascular Plant Associations". Annual Review of Earth and Planetary Sciences. 26: 329–377. doi:10.1146/annurev.earth.26.1.329. ↑ Tonkyn, David W.; Whitcomb, Robert F. (1987). "Feeding Strategies and the Guild Concept Among Vascular Feeding Insects and Microorganisms". In Harris, Kerry F. Current Topics in Vector Research. pp. 179–199. doi:10.1007/978-1-4612-4712-8_6. ↑ Pompon, Julien; Quiring, Dan; Goyer, Claudia; Giordanengo, Philippe; Pelletier, Yvan (2011). "A phloem-sap feeder mixes phloem and xylem sap to regulate osmotic potential" (PDF). Journal of Insect Physiology. 57: 1317–1322. doi:10.1016/j.jinsphys.2011.06.007. ↑ Den, Francesca F.; Stewart, Alan J. A.; Gibson, Amos; Weiblen, George D.; Novotny, Vojtech (2013). "Low host specificity in species-rich assemblages of xylem- and phloem-feeding herbivores (Auchenorrhyncha) in a New Guinea lowland rain forest" (PDF). Journal of Tropical Ecology. 29: 1–10. doi:10.1017/S0266467413000540. ↑ Novotny, Vojtech; Wilson, Michael R. (1997). "Why are there no small species among xylem-sucking insects?". Evolutionary Ecology. 11: 419–437. doi:10.1023/a:1018432807165. ↑ Douglas, A.E. (2006). "Phloem-sap feeding by animals: problems and solutions". Journal of Experimental Botany. 57 (4): 747–754. doi:10.1093/jxb/erj067. ↑ Baje, Leontine; Stewart, A.J.A. ; Novotny, Vojtech (2014). "Mesophyll cell-sucking herbivores (Cicadellidae: Typhlocybinae) on rainforest trees in Papua New Guinea: local and regional diversity of a taxonomically unexplored guild Ecological Entomology". Ecological Entomology. 39: 325–333. doi:10.1111/een.12104. ↑ "Digestive System". Entomology. University of Sydney. Retrieved 22 August 2015. ↑ Underwood, D. L. A. "Hemipteroids" (PDF). California State University. Retrieved 22 August 2015. ↑ Hall, Donald W.; Butler, Jerry F.; Cromroy, Harvey L. (1 September 2014). "Hackberry petiole gall psyllid". Featured Creatures. University of Florida/IFAS. Retrieved 12 August 2015. 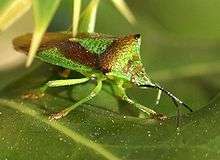 ↑ "Glossy Shield Bug: Cermatulus nasalis". Brisbane Insects and Spiders. 2010. Retrieved 16 July 2015. ↑ Cohen, Allen C. (1990). "Feeding Adaptations of Some Predaceous Hemiptera" (PDF). Annals of the Entomological Society of America. USDA-ARS. 83 (6): 1215–1223. doi:10.1093/aesa/83.6.1215. ↑ Goddard, Jerome (2009). 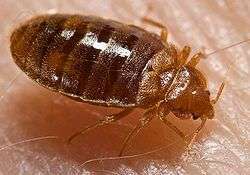 "Bed Bugs (Cimex lectularius) and Clinical Consequences of Their Bites". JAMA. 301 (13): 1358–1366. doi:10.1001/jama.2009.405. PMID 19336711. ↑ Poinar, G. (2005). "Triatoma dominicana sp. n. (Hemiptera: Reduviidae: Triatominae), and Trypanosoma antiquus sp. n. (Stercoraria: Trypanosomatidae), the First Fossil Evidence of a Triatomine-Trypanosomatid Vector Association". Vector-Borne and Zoonotic Diseases. 5 (1): 72–81. doi:10.1089/vbz.2005.5.72. PMID 15815152. ↑ Ivens, A. B. F.; Kronauer, D. J. C.; Pen, I.; Weissing, F. J.; Boomsma, J. J. (2012). "Reproduction and dispersal in an ant-associated root aphid community". Molecular Ecology. 21: 1–13. doi:10.1111/j.1365-294X.2012.05701.x. ↑ Evans, Edward W. (November 2009). 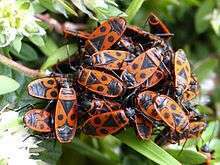 "Lady beetles as predators of insects other than Hemiptera". Biological Control. 51 (2): 255–267. doi:10.1016/j.biocontrol.2009.05.011. 1 2 Edmunds, M. (1974). Defence in Animals. Longman. pp. 172, 191–194, 201, 261 and passim. ISBN 0-582-44132-3. ↑ Wierauch C. (2006). "Anatomy of Disguise: Camouflaging Structures in Nymphs of Some Reduviidae (Heteroptera)". Am. Mus. Novit. 3542: 1–18. doi:10.1206/0003-0082(2006)3542[1:aodcsi]2.0.co;2. ↑ "Better IDs for E.A. Seguy Cicada Illustrations". Retrieved 24 August 2015. ↑ Wheeler, Alfred George (2001). Biology of the Plant Bugs (Hemiptera: Miridae): Pests, Predators, Opportunists. Cornell University Press. pp. 100ff. ISBN 0-8014-3827-6. ↑ Exnerova, Alice; et al. (April 2003). "Reactions of passerine birds to aposematic and non-aposematic firebugs (Pyrrhocoris apterus ; Heteroptera)". Biological Journal of the Linnean Society. 78 (4): 517–525. doi:10.1046/j.0024-4066.2002.00161.x. ↑ Lucchi, Andrea; Mazzoni, Emanuele (2004). "Wax Production in Adults of Planthoppers (Homoptera: Fulgoroidea) with Particular Reference to Metcalfa pruinosa (Flatidae)" (PDF). Annals of the Entomological Society of America. 97 (6): 1294–1298. doi:10.1603/0013-8746(2004)097[1294:wpiaop]2.0.co;2. ↑ Rakitov, Roman A. (2002). "Structure and Function of the Malpighian Tubules, and Related Behaviors in Juvenile Cicadas: Evidence of Homology with Spittlebugs (Hemiptera: Cicadoidea & Cercopoidea)". Zoologischer Anzeiger - A Journal of Comparative Zoology. 241 (2): 117–130. doi:10.1078/0044-5231-00025. ↑ Crowl, T.A. ; Alexander Jr., J.E. (1989). 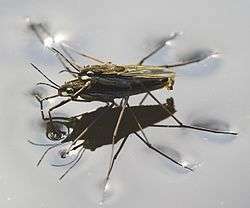 "Parental care and foraging ability in male water bugs (Belostoma flumineum)". Canadian Journal of Zoology. 67: 513–515. doi:10.1139/z89-074. ↑ "Sooty moulds". Royal Horticultural Society. Retrieved 16 July 2015. ↑ David L. Green (10 August 2003). "Cottony cushion scale: The pest that launched a revolution in pest control methods". Retrieved 16 July 2015. ↑ Capinera, John L. (October 2005). "Featured creatures". University of Florida website – Department of Entomology and Nematology. University of Florida. Retrieved 16 July 2015. ↑ de Queiroz, Dalva Luiz; Burckhardt, Daniel; Majer, Jonathan (2012). 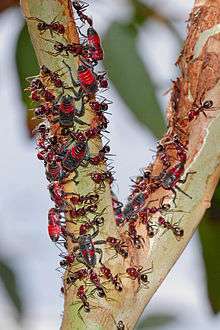 "17: Integrated Pest Management of Eucalypt Psyllids (Insecta, Hemiptera, Psylloidea)". In Larramendy, Marcelo L.; Soloneski, Sonia. Integrated Pest Management and Pest Control: Current and Future Tactics. pp. 385–386. ISBN 978-953-51-0050-8. ↑ Mahr, Susan (1997). "Know Your Friends: Damsel Bugs". Biological Control News. University of Wisconsin–Madison. IV (2). Retrieved 16 July 2015. ↑ James Hagler. Weeden, Catherine R.; Shelton, Anthony M.; Hoffman, Michael P., eds. "Geocoris spp. (Heteroptera: Lygaeidae): Bigeyed Bug". Biological Control: A Guide to Natural Enemies in North America. Cornell University. Retrieved 16 July 2015. ↑ Torres, Jorge Braz; Boyd, David W. (2009). 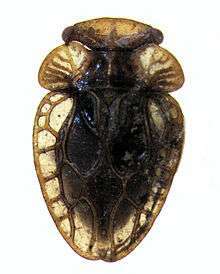 "Zoophytophagy in predatory Hemiptera". Brazilian Archives of Biology and Technology. 52 (5): 1199–1208. doi:10.1590/S1516-89132009000500018. 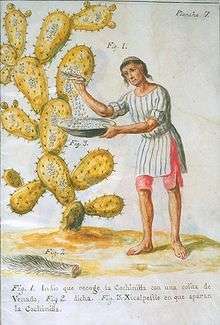 ↑ FDA Color Additives,"Guidance for Industry: Cochineal Extract and Carmine: Declaration by Name on the Label of All Foods and Cosmetic Products That Contain These Color Additives; Small Entity Compliance Guide". www.fda.gov. Retrieved 2016-02-22. ↑ "American Trypanosomiasis". Centers for Disease Control (CDC). Retrieved 17 July 2015. ↑ Goddard, J; deShazo, R (1 April 2009). "Bed bugs (Cimex lectularius) and clinical consequences of their bites". JAMA: the Journal of the American Medical Association. 301 (13): 1358–66. doi:10.1001/jama.2009.405. PMID 19336711. 1 2 Reinhardt, Klaus; Siva-Jothy, Michael T. (Jan 2007). "Biology of the Bed Bugs (Cimicidae)" (PDF). Annual Review of Entomology. 52: 351–374. doi:10.1146/annurev.ento.52.040306.133913. PMID 16968204. Archived from the original (PDF) on 5 July 2010. Retrieved 26 May 2010. ↑ Greenaway, Twilight. "The Best Way to Handle the Coming Cicada Invasion? Heat Up the Deep Fryer". Smithsonian. Retrieved 12 July 2015. ↑ Anthes, Emily (14 October 2014). 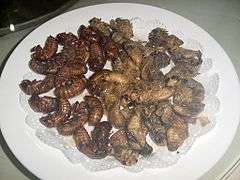 "Could insects be the wonder food of the future?". BBC. Retrieved 17 July 2015. ↑ "Future Prospects for Food and Feed Security". Retrieved 13 April 2016. ↑ "Cicada". Britannica. Retrieved 12 July 2015. ↑ Cunha, Erlane Jose; Montag, Luciano; Juen, Leandro (2015). "Oil palm crops effects on environmental integrity of Amazonian streams and Heteropteran (Hemiptera) species diversity". Ecological Indicators. 52: 422–429. doi:10.1016/j.ecolind.2014.12.024. ↑ Baker, Mitchell B.; Venugopal, P. Dilip; Lamp, William O. (2015). "Climate Change and Phenology: Empoasca fabae (Hemiptera: Cicadellidae) Migration and Severity of Impact". PLOS ONE. 10 (5): e0124915. doi:10.1371/journal.pone.0124915. PMC 4430490 . PMID 25970705.